Many small businesses and solo entrepreneurs dive into social media marketing strategies without visualizing a bigger plan. What ensues is usually far from what they had hoped. Instead of attracting more leads and sales, they end up wasting time, money and passion. This problem can be easily remedied by taking time to learn from those who are already experiencing success with social media marketing and by implementing a clear, specific, actionable and measurable web marketing plan. In this article, I’ll give you a step-by-step overview of the actions that will M.O.S.T. help you succeed in marketing your business online. 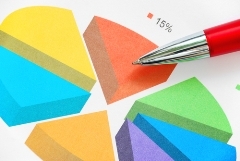 Before you implement any social media marketing strategy, you need to create a marketing plan. A plan always starts with research. It’s amazing how many businesses fail to do this step properly before they start marketing. I’ve been guilty of it in the past, so I can sympathize! Think of it this way: Would you rather hop in a plane with clear instructions on how to get to your destination, or play it by ear? Who are your target audience and competitors? How are they using social networks? How are they interacting or communicating with others? What are the best ways to catch your audience’s attention and engage them? Keyword research: You would do well to find out the keywords your target audience is using to find solutions to their problems. A brilliant tool for this is Market Samurai. Surveys: Perform surveys to find out what your target market is really thinking. Forums: Hang out in niche/interest-specific forums and interact as much as you can to build relationships and find out what people are talking about. Quantcast.com: See public information on popular websites in your niche to get a snapshot of what you can expect for your own. Google trends: Find out what’s hot in the search engines now. Google competitors: Check out the top 15 ranking websites in Google for the keywords relating to your niche and look at what they’re doing online. Twitter search: Keep your finger on the pulse of the marketplace by instantly revealing real-time tweets for certain keywords and phrases. After you’ve gathered valuable and actionable information about your target market and about your competitors, you can then set your objectives. Increase website traffic by X% within the next 6 months. Increase sales revenue by X% by December 2011. Improve search engine rankings and get on page 3 of Google (or better) for specific target keywords (list the keywords). Increase lead generation by X% per month by November 2011. Reduce customer acquisition costs by X% before December 2012. Remember: you can’t achieve what you can’t measure, so it’s essential to establish measurable and targeted objectives! 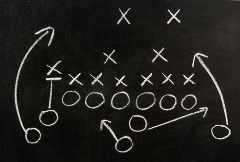 Create a social marketing strategy with a tactical plan of action. Twitter could be gone tomorrow – replaced by a competitor… or your target audience may stop using it. What will you do then if your strategies bank on that particular service? A sound strategy will align you with your objectives. Effective tactics will save you time and money and amplify your success. 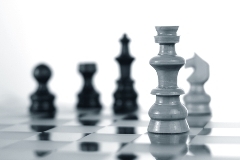 Tactics are specific actions, steps or decisions that you can use to execute your chosen strategy. Build a branded, customized blog. Start building a list by using our blog’s content as bait. Create a high-converting opt-in section in our blog. Make it convert well by creating an irresistible freebie to give away. After you have formulated your M.O.S.T. plan, it’s time to identify, assess and select the appropriate social platforms to use. The most popular social media platforms for business are LinkedIn, Twitter, Facebook and YouTube. The best ones to leverage are those where your target audience is already active and engaged. So go to where they are, interact with them, build a relationship and then drive them to an appropriate website of yours (for best results, send them somewhere that continues the conversation, like a business blog). Your choice and prioritization of platforms should depend on how well they fit into your strategy and how regularly your target audience uses them, NOT which brands are currently generating the most hype on them. For example, a common trend identified by Marketing Sherpa is that there aren’t many businesses that blog because they perceive it as difficult to initiate and maintain when compared to the investment in Twitter, Facebook, social bookmarking, etc. As a result, these businesses make the mistake of focusing on using specific media just because they are perceived as easier to set up and use, not necessarily because they generate the best return. Marketing Sherpa’s Social Media Marketing Report 2010 revealed that tactics related to blogging and microblogging earned the highest ratings among social marketers in terms of the most effective tactics for achieving objectives. Once you’ve established your presence on the appropriate social media platforms, the best way to profit from those relationships you’ve built is to drive them to your blog (NOT your company website) and engage with them even more. Post valuable, useful content that demonstrates your expertise, and encourage your audience to spread your message. Encourage interaction with your market. Instigate conversations. The more participation and involvement you can generate from your audience, the better. Pre-sell, NOT sell. Many business blogs make the mistake of posting exclusively about their sales, promotions or discounts. Give a taste of what it’s like to work with you or buy from you (fun/enthusiastic/easy, etc.). The above are key reasons why it’s best to direct Internet users to your blog, not your website. As long as your target market can be found online and as long as you’ve identified specific platforms that your prospects actively use, you’ll need a business blog to effectively market online. Convert visitors into leads on autopilot by getting them into your sales funnel. Establish you as a trustworthy thought leader in your niche. Convert leads into loyal, raving fans. Help spread your message and generate buzz by digital word-of-mouth marketing. Your sales funnel is the process you’ll use to take a prospect from unfamiliarity (“I don’t know you”) to loyalty (“I love you!”) or even fanaticism. Opt-in: When a prospect arrives at your blog, offer them something of massive value in their eyes (maybe an ebook, report, video series, etc.) in exchange for their name and email address. Relationship building: Using an auto-responder, send them an email every week or twice a week. Your email should also contain something that gives massive value. It could contain tips, links to tools, strategies, reports, updates, etc. Make sure to give value and build your relationship with your audience before you try to sell them anything. Make an offer: We recommend a ratio of 80% free, valuable content and 20% selling. This means that 80% of your emails give value (no selling) and only 20% of them are invitations to take their experience of you to a higher level and buy from you. Insanity is commonly defined as doing the same thing over and over again and expecting different results. Measure: Finally, you need to track your progress while marketing with social media so that you can see where you’re getting the most success and the best bang for buck. Network size in terms of followers, fans, etc. Identify what’s not working and then either tweak your approach to make it work, or discard it. Identify what IS working and then scale up that approach to produce a wider smile. If you don’t have a blog—start one now. Marketing Sherpa has already identified that if you don’t have a blog, you’re going to find it more difficult to achieve your business objectives through marketing online. To get the most out of business blogging, check out How to Engage With Social Media and 5 Ways to Make Your Blog Posts Outstanding. If you’re already using a blog, are you doing well to leverage social media in your favor? Are there any tips or tricks you have to share with our readers? Let us know and leave a comment in the box below. Clément Yeung is the Co-Director of Easisell, a digital marketing & design company that helps small businesses achieve success online.